Sometimes I get inspired to make things I have never tried before. A lot of the time, that doesn’t work out. Sometimes it is because I made it poorly and sometimes I think I just don’t like the new thing I am trying. This doesn’t get me down though, I keep on keeping on, trying new things. 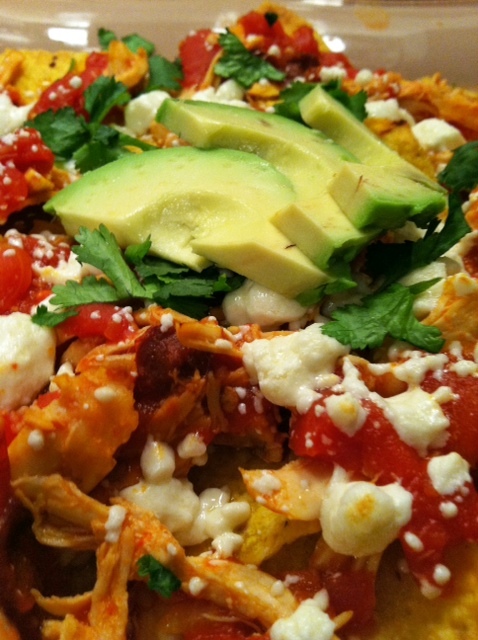 It’s a good thing too because I have never had Chicken Chilaquiles and I LOVE THEM! 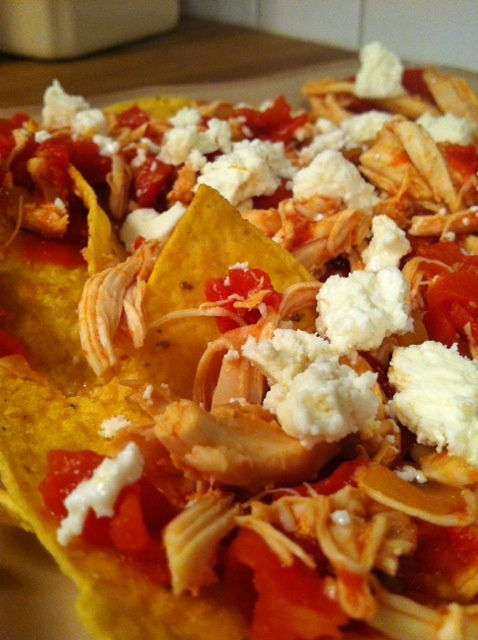 I love saying Chicken Chilaquiles (chee-lah-KEE-lays) too. 3 times fast! This recipe involves chipotle peppers in adobo. If you haven’t tried these, they are a little spicy and have a perfect smokiness. 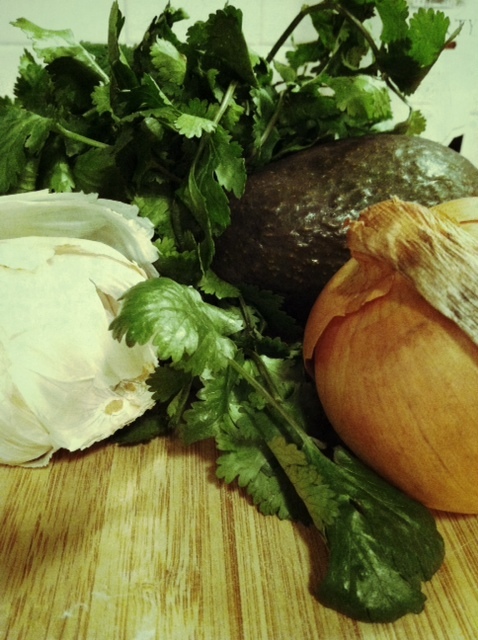 They also include some of my other favorite ingredients: garlic, avocado and cilantro. You know what else I love? Queso Fresco. It had been hard to find (for me at least) but now it is everywhere. You should love it too! Then we could all love it together. Saute onion in a large skillet. 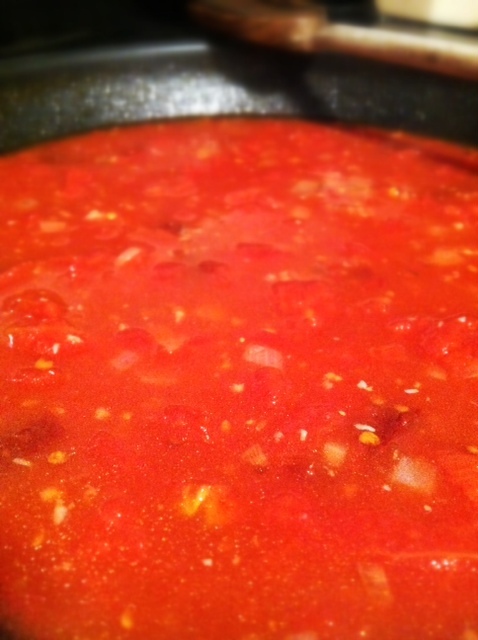 To that, add whole tomatoes. 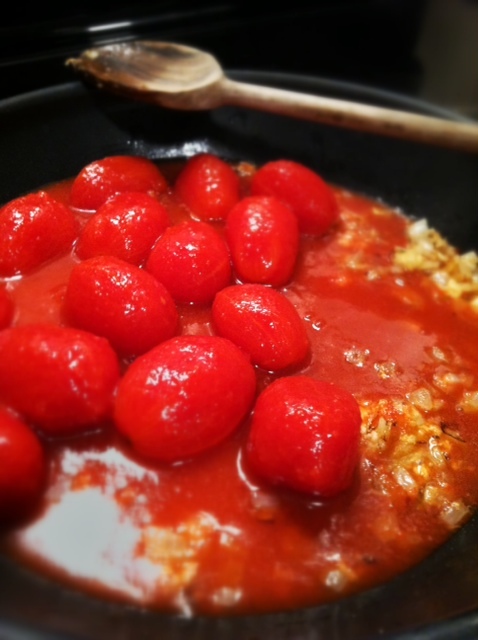 Gently, so that you don’t have tomato seeds and juice all over the kitchen, break up the tomatoes. I used a potato masher. Then add two chopped chipotle peppers in adobo. After this you will mix in chicken and cilantro. 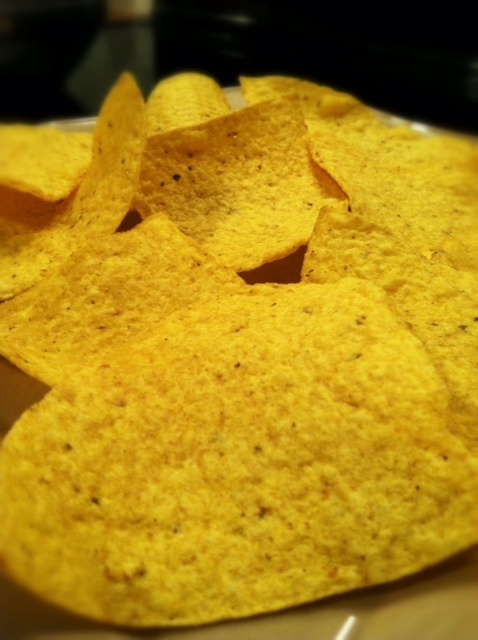 Arrange some large good quality tortilla chips on a plate. You want them to be large because the sauce will sort of soften part of the chip (in a good way) and you will want to fold them while you’re eating. Trust me. Top the chips with the chicken/tomato mixture and crumble with cheese. At this point I pop the plate into the oven for a few minutes to get the cheese melty. Then you sprinkle with cilantro. I really liked the spiciness with this dish. You could adjust it with more or less chipotle peppers. 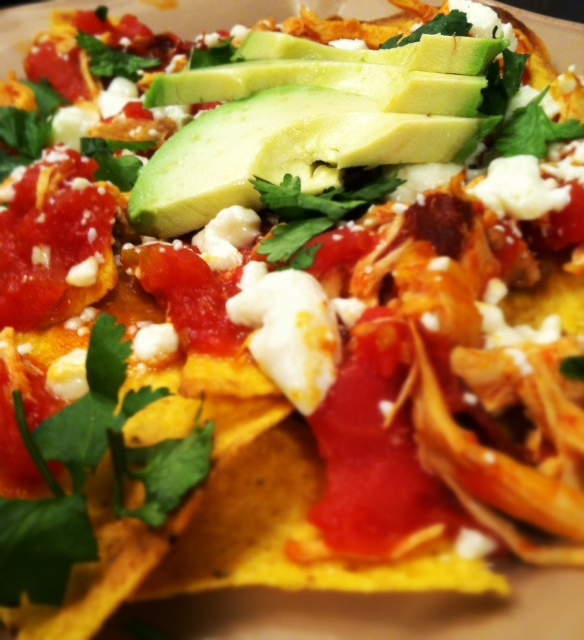 What isn’t fun, about everyone at the table with their own plate of nachos!?! Divide chips among four shallow bowls or plates that come up on the sides; top with chicken mixture and sauce. Sprinkle queso fresco on top and pop back in the oven to let cheese soften/melt. 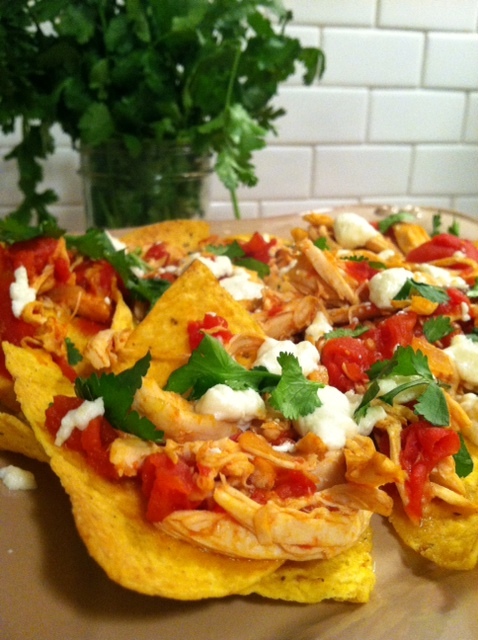 Garnish with cilantro sprigs and sour cream. Serve.